The 38-member probable squad for the AFC U-23 Championship qualifiers was released a little over a week back. Sarthak Golui, Anirudh Thapa, Ashique Kuruniyan, and Vinit Rai were called up to the national camp. These 4 were also part of the Blue Tigers during the recent AFC Asian Cup in UAE. Goalkeeper Dheeraj Singh, Mohammad Nawaz, Anwar Ali and Prabhsukhan Gill are also amongst the popular players to be shortlisted. 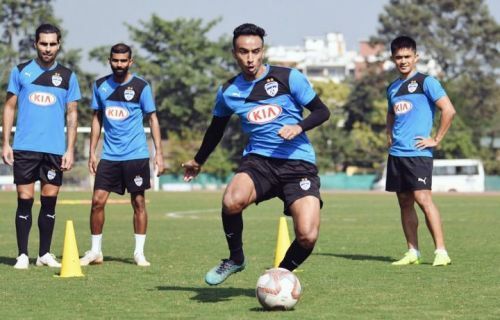 Meanwhile, Derrick Pereira has been roped in by the AIFF as the head coach of the U-23 side and will preside over the national camp which is slated to begin on March 2. India are placed in Group F of the 2020 AFC U-23 Championship qualifiers alongside Tajikistan, hosts Uzbekistan, and arch-rivals Pakistan. Pereira's troops will square off against Tajikistan in their first encounter on 22 March. Besides Thailand, who automatically qualify as hosts, 15 other teams will make qualify for the 2020 AFC U-23 Championship on the basis their results in the qualifying event. A big squad has been called up for the national camp but there are still some deserving players who failed to make the cut. In this article, we do an analysis of the 5 players who should have been called up for the Indian national team camp. Before we begin, we would like to name the honourable mentions in this Top 5 list as Thoiba Singh of Minerva Punjab and Vikram Pratap Singh. Lalthathanga Khawlhring is a fine young talent. The 20-year-old hails from Mizoram and began his career with Bethlehem Vengthlang. He was honoured as the Best Midfielder in the Mizoram Premier League for the year 2015-16 season. The midfielder soon moved to DSK Shivajians' youth academy. He made his debut for the senior side on 8 January 2017 in an I-League match against Mumbai Football Club. NorthEast United FC roped in the promising youngster in a three-year deal. Lalthathanga wast sent on loan to play for Aizawl FC for the 2017-18 season. After an impressive display on loan last season, NorthEast United have shown faith in Khawlhring during the ongoing edition of ISL. The midfielder has got an impressive 1079 minutes of playing time in the 17 matches which The Highlanders have played thus far. Khawlhring has an assist to his name besides having a passing accuracy of 71.7%. The talented player averages 27.65 passes per game and is also seen helping out his defence. He has impressed gaffer Eelco Schattorie with his menacing runs on the right flank and ability to pull the strings in the midfield as well as whipping in crosses. The versatility of the player makes him a promising prospect and his performances in the ongoing ISL should have earned him a call up to the national camp for AFC U-23 Championship qualifiers.